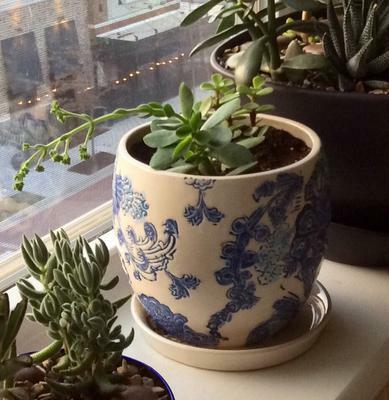 Can you help identify this succulent? 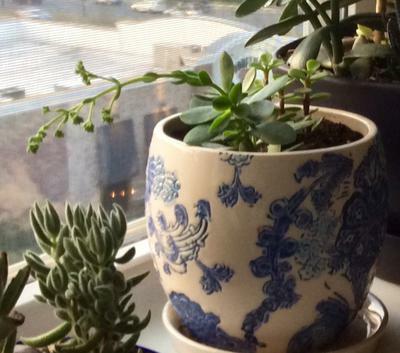 I am not sure what type of succulent this is. It has flat round leaves growing close together at the base and a long thin stem with small clusters of 'berry-like' growths at the top. 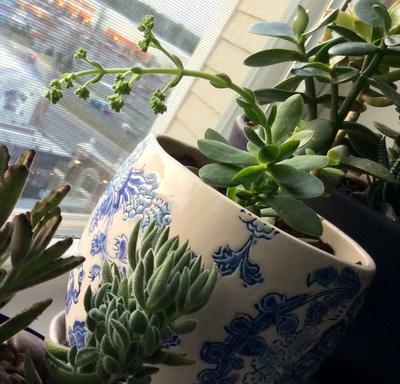 Comments for Can you help identify this succulent? Thanks for giving me a name Jacki. At least I can look it up and care for it properly now. It should be pretty cool to see it flower! News Flash; that long stem with the balls on top is a flower stalk. They just haven't opened yet. When they do they'll most likely be pale pink. How do I know that? Because this is Crassula multicava - more on it here where there is also a link to Daves Garden Website with detailed information on this plant.